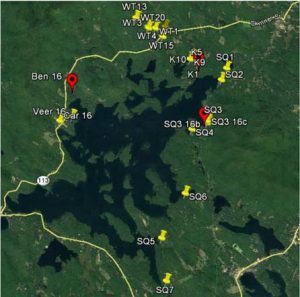 Plymouth State University’s Center for Environment (CFE), the Loon Preservation Committee (LPC), and the Squam Lakes Association (SLA) are partnering to help share information about recent findings of environmentally-significant levels of persistent organic pollutants (POP) in sediments of certain streams draining into Squam Lake. A report released by LPC in 2017 showed that three of their sampled sites contained environmentally-significant levels of PCBs and that two of those also had elevated levels of DDT and degradation products. Previous analysis of unhatched loon eggs showed presence of significant levels of PCBs, dioxins, flame retardants, stain guards, and pesticides (DDT and chlordane).